Whilst the exhibition at Touchstones finished a couple of weeks ago, some of the work can be seen in new exhibition on from the 12th April til July 20th at Ruthin Craft Centre, North Wales entitled ‘Construct’. 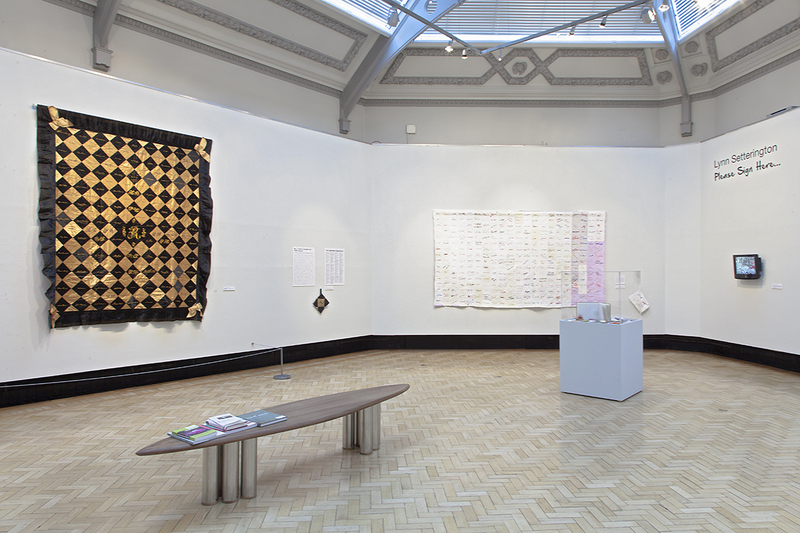 It features eight textile artists exploring identity in different ways. Then in Sept I am curating an exhibition at the IQSC LIncoln, Nebraska juxtaposing some of my signature quilts alongside examples from their collection. 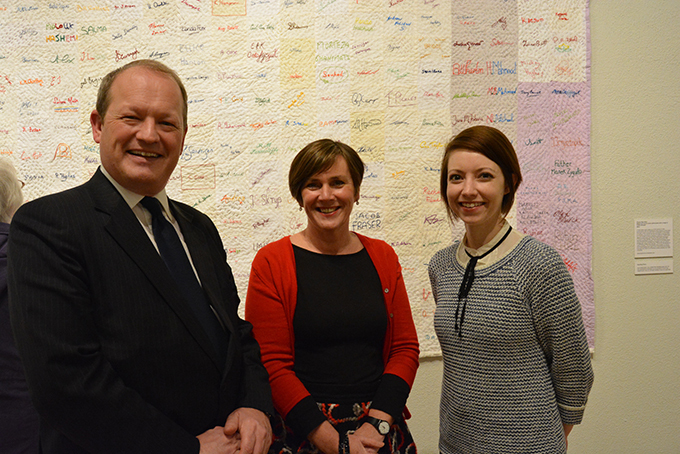 The exhibition is nearing its end so if you haven’t made it down yet, make sure you get there by the 8th March. Comments in the visitors book are very positive and Jill Randall’s show is on in the ajoining gallery. The exhibition will start to go up in the next few days. 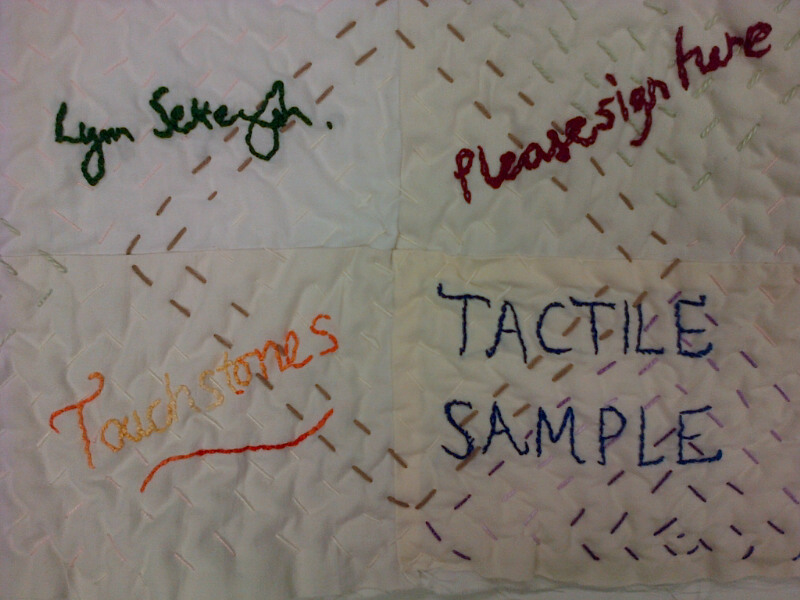 Myself and Alison Salter have created handling peices that will sit alongside the quilts. Alison’s related to the 1895 quilt and mine the recent collaboration. I am really looking forward to seeing it all in one place, it has been good to have a bit of time to reflect and let the quilt “rest” in my studio. Alison has done an amazing job researching the story behind the nineteenth century collaboration. The preview of the show is 6-8pm Friday 13th December, the exhibition remains on until March 2014 – spread the word. Last night I finished sewing, the last job was the cloth channel on the back of the cloth to allow a baton to be passed through to hang the quilt at Touchstones. I made a couple of last minute changes to the composition, swapping a few of the lilac pillowcase signatures with some cream ones. When I looked at my photos of the whole quilt last week I didn’t feel the colour distribution was quite right so I am glad I made the change. 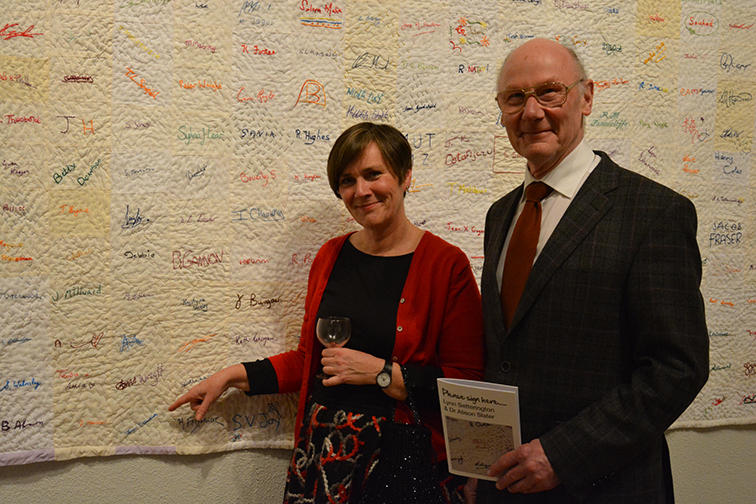 It was a good feeling after so long to finish the quilt, the weight of responsibly is a heavy one with so many people being involved. Only the handling sample left now to do now. The slide show is pretty much there too. 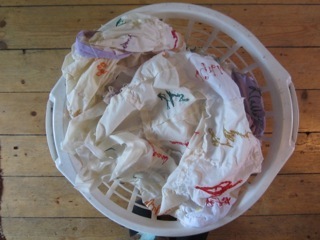 This will accompany the quilt in the show. It was interesting to see again all the workshop sessions which chronicle of the making over four months. The exhibition opens on the 14th December but anyone involved in the project is welcome to the private views on Friday 13th 6- 8pm. Myself and Alison Slater are doing a talk in January about the whole project. Dates should be on the Touchstones website soon. The last stage of making the quilt. Having taken time to think about how to actually quilt the cloth I decided on a strategy that I am happy with and that works. I have decided to use the diamond shape that dominates the old 1895 example for the quilting pattern. However the quilting it is not purposely precise or detailed. Rather I have used bold intuitive stitching in a range of muted colours. This not only works with the scale of the quilt but adds texture to the surface. 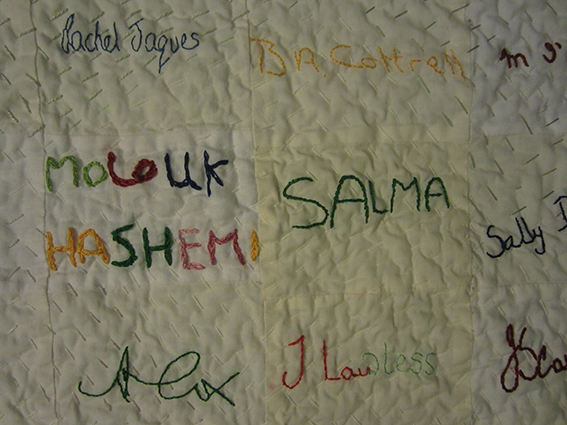 I realise there could be a danger of it clashing or fighting with the sewn signatures, but I think it is the opposite and the quilting really brings the signatures together. 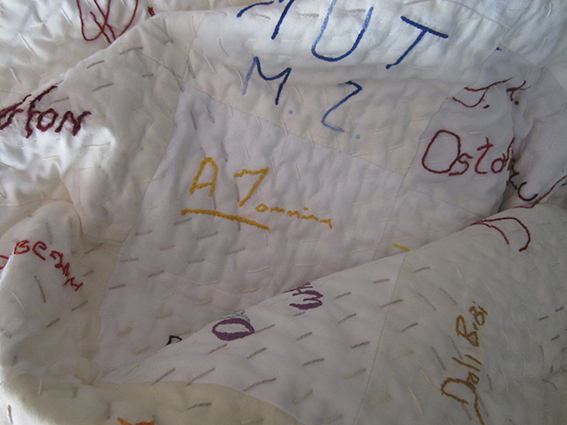 By allowing the quilting patterns to cross into a few different names they are united and melded together. I am over half way now so the end is in sight. I did consider a couple more sessions to work on this as a group but in the end I felt it was my own contribution to the quilt and something i would like to see through to the end. 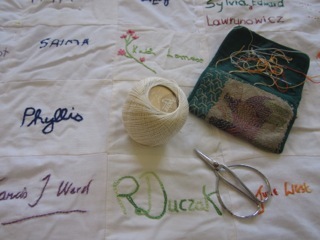 The text panels and photos of workshops are almost sorted too, ready for the December exhibition. I am really looking forward to seeing it all together in one space. 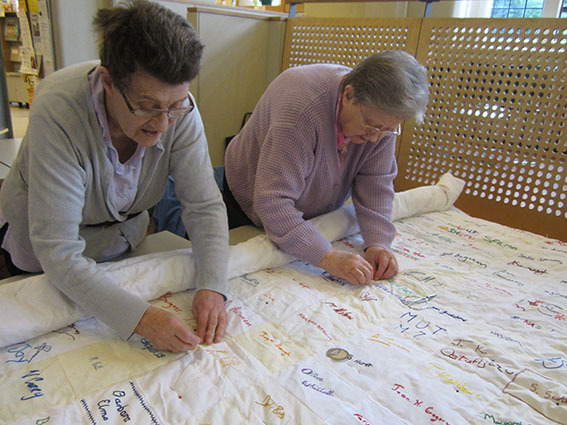 The last couple of weeks have seen all the 336 “postcards” made up of Rochdale signatures come together in one big cloth. I finished piecing the top cloth, washed and ironed it, all ready for the workshops back at Touchstones, quite a tight turn around. However, Saturday was a really enjoyable calm session with three stalwart helpers. 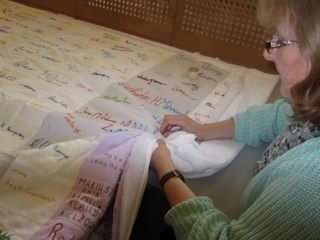 Mary, a retired mid wife originally from Ireland and sisters Winifred and Betty, all of whom had added to their signatures to the quilt. 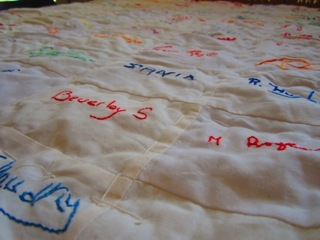 Mary probably delivered some of the people who’s names are on the quilt. Now the backing is on and a layer of wadding between we spent the day tacking all the layers together, ready for quilting. 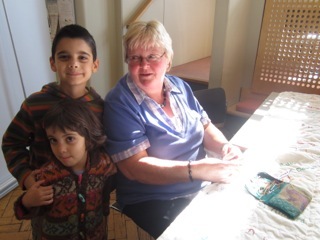 On Tuesday Mary kindly returned and we had a few other helpers. Children going in a workshop admired the work as they passed by and a number of people popped in to check on progress. A lovely family stayed and chatted for ages as Lindsay sewed. In the afternoon the knitty gritty group arrived for the monthly knit-in so likewise they scanned the cloth for familiar names and it was nice to see them pointing to people they knew. Some wonderful creative knitting in the group too, an amazing knitted four and twenty blackbirds baked in a pie, wish I had photographed it.